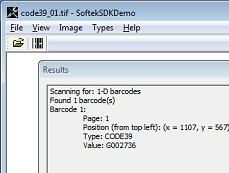 The Softek Barcode Reader Toolkit for Windows is an SDK that enables applications to extract barcode information from images. The API's available in the toolkit include .net, java, com, ocx and windows dll. The standard version includes support for both 1 and 2-D barcodes and special features include the ability to split documents by barcode position. 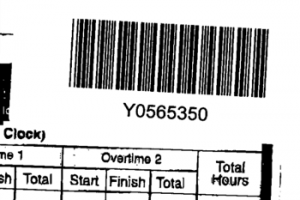 The SDK is typically used in an application that scans documents containing printed barcodes. The application calls a function in the toolkit to extract the barcode value for an image and then uses this value as a key for a database table. The SDK can also be used in applications that need to detect barcodes in images from cameras. Detection of both 1-D and 2-D barcode types. API's for .net, com, ocx, java and windows dll. File formats: TIF (single or multi-page), JPG, PNG, GIF, BMP and PDF(optional module). Memory bitmaps: DIB (HBITMAP or HDIB). Barcode reader software that reads barcode values from images with an optional PDF upgrade. The barcode reader SDK works with Visual Studio, Delphi, Borland C++ and many other environments. Barcode Reader Software with support for both x86 and x64 versions of Windows using .net, dll, com, ocx and java interfaces. 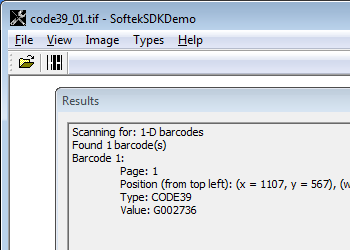 The Softek Barcode Reader Toolkit for Windows is an SDK that enables applications to extract barcode information from images. The API’s available in the toolkit include .net, java, com, ocx and windows dll. The standard version of the barcode reader software includes support for both 1 and 2-D barcodes and special features include the ability to split documents by barcode position. The Windows Barcode Reader SDK is typically used in an application that scans documents containing printed barcodes. The application calls a function in the barcode reader toolkit to extract the barcode value for an image and then uses this value as a key for a database table. The barcode reader SDK can also be used in applications that need to detect barcodes in images from cameras. Barcode Types: Codabar, Code 128, Code 2 of 5, Code 3 of 9, PDF-417, EAN-13, UPC-A, EAN-8, UPC-E, Datamatrix and QR Codes.